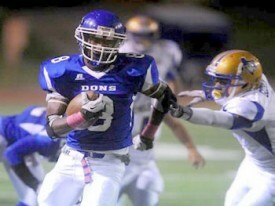 Palo Duro WR Montrel Meander gives the Longhorns a speed threat for the 2013 class. Welcome to the 40 Acres Montrel Meander. Meander, a 6’3″, 180 pound WR/S from Palo Duro High School in Amarillo became the fifteenth 2013 commitment after a last minute official visit to Austin. Meander had long been committed to Washington State, but flipped this weekend in favor of the good guys. Meander is an athlete. He can play either safety or wide receiver. As a spread wide receiver he shows excellent straight line speed and could be the deep threat this offense so desperately needs-especially with the departure of the drastically-under used Marquise Goodwin. His route running is raw, but he shows great separation at the line of scrimmage and a willingness to go across the middle and make a tough catch. As a safety, Meander showed really good instincts and takes good angles when tackling. He shows the ability to cover sideline to sideline, sheds blocks well, and wraps up-all of which are sorely needed in the Texas secondary. Meander’s number one weapon however, is his speed. The young man can fly. Track speed doesn’t always transfer to football speed, but in this case it does. He has documented track times of 21.55 seconds in the 200 meters, 10.9 in the 100 meters, as well as a 4.46 second 40 yard dash and boasts a 21’3.5″ long jump. Will he be a tool for Major Applewhite or for Manny Diaz? He could help either side. My bet is that he ends up at wide receiver at least for the time being. The Texas offense will be better in the next season due to the departure of offensive coordinator Bryan Harsin and his manic, almost bi-polar play selection. Major Applewhite remains Co-Offensive Coordinator, but will now share the role with wide receivers coach Darrell Wyatt. What will make 2013 better than 2012 is that Major Applewhite will be doing what he should have been doing for the last two seasons: calling plays and coaching quarterbacks. The Alamo Bowl is a small sampling to draw conclusions from, however, it showed that Applewhite has the ability to maximize the talent on offense. He crafted roles for guys based on their unique skill sets. Absent from the Alamo Bowl was Harsin’s dogged insistence on forcing round pegs into square holes. Applewhite didn’t try to outsmart anyone; no mass substitutions, no multiple shifting at the line of scrimmage, no trickery. The game plan wasn’t perfect, but it showed one key element that seemed absent for much of the past two seasons: the ability to adjust when the original plan wasn’t working. Simply put, Harsin wasn’t a good fit at Texas. The players didn’t respond to him. They didn’t relate to him. Harsin wasn’t a Texas guy. 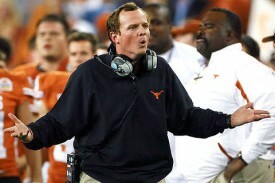 Major Applewhite is Texas. Every recruit in the Southwest knows the name. Their mothers and fathers remember the Big XII Championship game and the Holiday Bowl. Applewhite has the infamous “It” factor that Harsin lacked. Please don’t get me wrong… I don’t think the 2013 season will be all sunshine and rainbows, but we will see a more cohesive team. We will see more discipline. We will see more accountability. We will see more heart. The old saying, “Attitude reflects leadership” certainly applies here. I don’t see this next iteration of Longhorn football cowering to Oklahoma or self-destructing against West Virginia. I’m excited to watch these guys go play as well. All these things can be said about the newest member of the 2013 Longhorn football team, Desmond Harrison. Harrison’s arrival can not come soon enough for a Texas team that desperately needs a dose of nastiness in the offensive line. Championship teams are built from the inside out-specifically the offensive line. A strong offensive line extends drives: punts become field goals; field goal become touchdowns. More touchdowns leads to more victories. Victories are a good thing. They keep people employed. They keep fan bases happy. They keep stadiums full. They keep bank accounts full. Jonathan Gray and Malcolm Brown have larger holes to run through. Bigger holes mean more rushing yards. High rushing totals allows for play action passing. Ash is a much better quarterback when there is a running game that can put up big numbers. David Ash has more time to progress through his reads and has larger throwing lanes. A comfortable David Ash with wide throwing lanes makes Jaxon Shipley and Mike Davis better receivers. Extended drives leads to a rested defense. If their offense isn’t on the field, that severely restricts the other team’s ability to score points. Adding Harrison will lead to some changes in the offensive line depth chart. If Harrison is everything he’s expected be, he’s penciled in as the starting left tackle from day one. 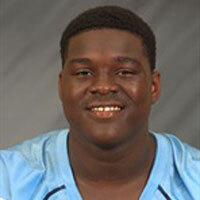 This will prompt last year’s Juco signee, Donald Hawkins to shift inside to either guard or center. Another possibility at the center position would be Mason Walters. Either would be an upgrade over incumbent Dom Espinosa, who was often over powered by the bull rush and lacked the speed to get to the second level. Not to mention the debacle that was the West Virginia game, but there’s no reason to beat a dead horse here. Is Harrison a sure fire starting left tackle in the NFL? If I could answer that with any degree of certainty my bank account would look much more attractive than it does now. However, I can saw with a high level of confidence that he has enough God-given athletic ability to have a chance to hold up a jersey at the draft and flash a Hook ‘Em for the cameras. The question surrounding Desmond Harrison is the same one that has surrounded every other elite prospect that has walked into DKR: Will that talent be developed to its full potential? Will he get stronger? Will he get faster? Will his tendency to play too tall and rely on his freakish athletic ability be corralled and coached into flawless technique paired with unreal athleticism? I have faith in Stacy Searels, Major Applewhite, and Bennie Wylie. I am supremely confident that Harrison is the real deal and will be an impact player from the first snap of the 2013 season.